Rivera Kills? Really? Did you just place a statement that you're a killer on your body in permanent tattoo? Way to go genius! We’ve all heard of cases where a suspect or a corpse was identified by his distinctive tattoo. And other criminals have been done in by maps and “To Do” lists recovered by the police. You know, the dude had a hand-drawn map to the victim’s home, maybe even a sketch of the interior, and a list that reminded him of everything he had to do to do the deed. Things like: gloves, mask, duct tape, gun, and, oh yeah, top off the gas tank in case a chase ensues. One Anthony Garcia can top all of that. 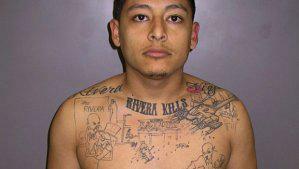 He supposedly belongs to the Rivera-13 gang in Pico Rivera, CA. He allegedly shot and killed 23-year-old John Juarez in a liquor store 4 years ago. He got away with it. Almost. It’ll be interesting to see how they use this is court but one thing I know for sure—if you put this in a book, no one would believe it. This entry was posted on Wednesday, July 27th, 2011 at 18:13 and is filed under Uncategorized. You can follow any responses to this entry through the RSS 2.0 feed. You can leave a response, or trackback from your own site.